Like many people, I’ve always had an aesthetic aversion to the yellow smiley face. Not only did I find it visually unappealing, but due to overuse I thought of the smiley as a trite visual cliché. But that was the old me. Now, the more I explore and decode smiley faces and their related family members, the more appreciation I have for the complexity of how two elliptical eyes and a mouth line can communicate emotion. The fact that we understand the expressions depicted in schematic faces—from emoticons to smiley faces to simple cartoons—is a fascinating feature of the human brain. By schematic faces, I’m referring to simple line drawings or marks that depict the organizational pattern and basic features of a face. 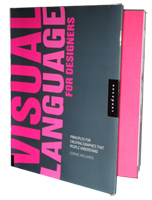 Using schematic faces in various types of visual communication is one way to leverage the human ability to interpret facial language quickly. It’s safe to say that our brains are attuned to the human face, most likely because faces are loaded with information. When we perceive a face, we gather information about the person’s identity, emotional condition, direction of eye gaze, facial movements and head gestures. Faces are rich with information important to survival, such as identifying whether someone is familiar or a stranger. Faces are also rich sources of information relevant to social interaction, such as whether a person is approachable or wants to be left alone. Fortunately, we rapidly read and process emotional expressions. It is fairly well agreed upon that each type of facial information processing occurs through different functional specializations and neural mechanisms in the brain. The conveyance of facial expressions are uncannily reflected in schematic faces. This is probably due to our competence at reading and interpreting what is known as the facial code, which many believe is universal to all people in all cultures. 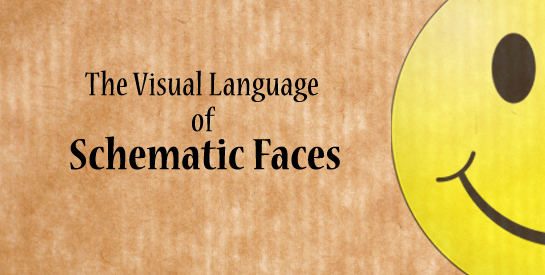 The facial code refers to the emotional messages that are expressed by movements of the facial muscles around the eyes, mouth and sometimes the nose. Thus, we decode emotional signals by perceiving the position or slant of a person’s eyebrows, the shape of the eyes and mouth, and the wrinkles around facial features. This constitutes the facial signal system that humans use to convey emotions. There have been many attempts to use schematic faces in everything from infographics and data visualization to identity designs and communication aids. Some are more effective than others. Here are a few examples below. Infographic Use: This infographic from Good Magazine (click graphic for the original) depicts the happiness quotient of people in 13 countries over a 30 year time span. The important facial element is the mouth, which serves as a line graph against four gray dotted lines that are placed behind the face. The bottom most gray line represents the least happiness and the top gray line represents the greatest happiness. The graph forms a facial expression that might correspond to the data. I’m not sure. Communication Aid: The Wong-Baker Faces Pain Scale uses schematic faces to help people communicate about their level of pain during clinical exams. Originally developed for children, it is now used in many healthcare settings where language barriers or communicative disorders interfere with communication. 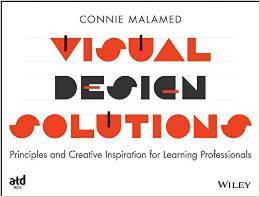 Logo Design: What happens when a schematic face is incorporated into a logo design? Although this approach would not work for most companies and organizations, it certainly adds a little personality to the brand. In particular, there is something playful and amusing when a schematic face is paired with an object as seen in the two logos on the right. I think it’s valuable to understand the power that is conveyed in the face. And that we can take advantage of it with simple line drawings is a tribute to the human intellect. Hershler, Orit and Hochstein, Shaul (2005). At first sight: A high-level pop out effect for faces. Vision Research:Volume 45, Issue 13, June 2005, 1707-1724. Flury, B., & Riedwyl. H. (1981). Graphical representation of multivariate data by means of asymmetrical faces, Journal of American Statistical Association, 76, 757-765. Ah, Connie, I feel better reading this post of yours. I had this guilty feeling that I might be a closet curmudgeon when I reflect on how much I disliked the original smiley face. I think that you and I both were bothered the insipid simplicity of it, the somewhat forced yet blank conveyance of purported happiness, and the sheer enormity of the armies of its appearance during its original emergence in popular culture. Also, in nature black on yellow hollers “warning! !” (a phenom known formally as “aposematism” (from apo- away, and sematic sign/meaning). The black-on-yellow warning symbolism in nature (like that seen on the honeybee or the poisonous banded sea krait) of course has been copied internationally on traffic signs, for yield and danger, etc., so we were perhaps guided by common sense, as much as anything else. 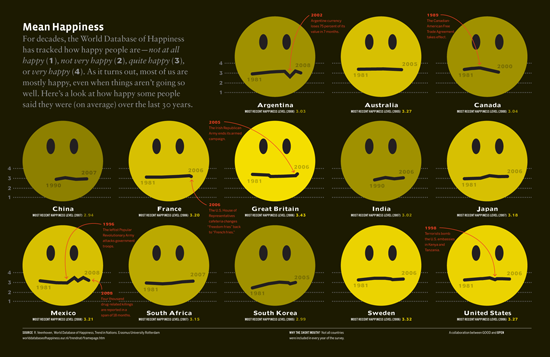 Enjoyed seeing the nuances of the world happiness factor smiley faces…a visual worth double-clicking on for stats of world-wideness happiness around the world. Who knew there was an official World Database of Happiness?? All I can say is your comment is fascinating. Great contribution. Thanks.